Now sells Liberation Ale on draught as well as the cider but it is a sports bar with all that entails. Now it's the Up and Down bar, good for sports, decent beer on tap and cider (try the Addlestons....) and good selection of wines by the glass and bottle. Separate bar upstairs for private parties and when there is a big match on...... Food is good and very cheap. This is now the "Up and Down " sports bar and is one of many pubs on the island which are either being closed or changing from traditional pubs into theme or venue bars/restaurants. 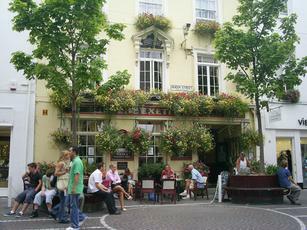 Typical Town Pub, but looks inviting from the outside with lots of hanging baskets and tables. Sadley the inside lets it down, in need of a revamp and a lick of paint. Tobacco stained walls and ceilings. Would go back if it was "Made Over". Typical Range of local and International beers.